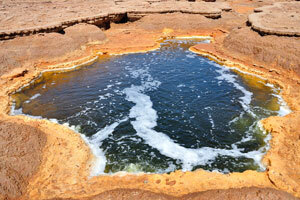 There is a great variety of hot springs in the Danakil Depression that differ by shapes, sizes and colours. 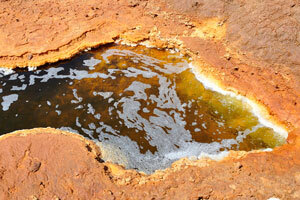 One of these hot springs is Yellow lake which is a famous place often visited by organized tourist groups. 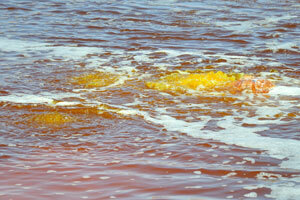 Yellow lake is not an ordinary lake filled with water, this lake fully consists of pure sulphuric acid, which flows straight from the bowels of volcanoes. 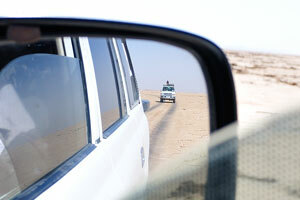 Another jeep from our group can be seen in the rearview mirror. 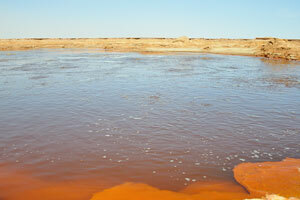 We have arrived on Yellow lake. 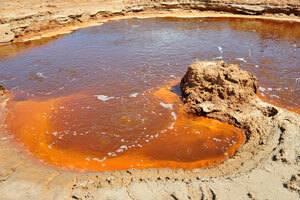 Yellow lake is another geology jewel, having the waters colored by minerals. 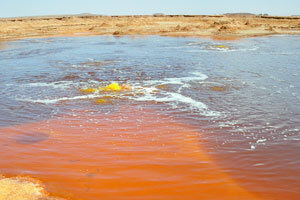 Yellow lake is showing the presence of gas bubbles from the underground. 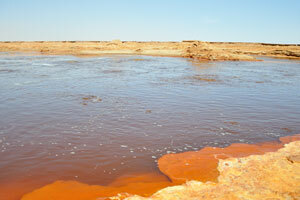 This little lake called by the Italian geologists “Yellow lake” because of the supersaturated red waters. 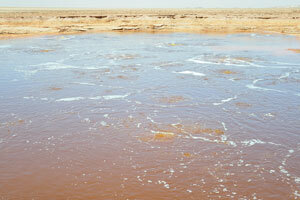 Water gurgles not due to the temperature, but due to the bubbles of gases coming from underground. 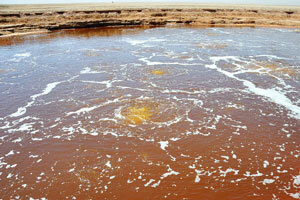 Fountains of Yellow lake show the yellow color of the water. 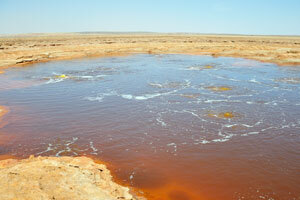 The colour and bubbling coming from this lake does not make it very inviting. Unfortunately, Mother Nature played a very dirty trick on all the dead birds scattered around the lake. I imagined myself exploring these regions in ancient times. 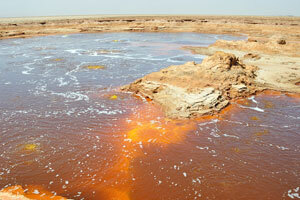 Sun rays shimmer on the surface of acidic lake. 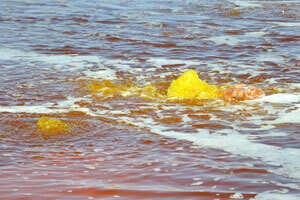 The most yellow part of the lake is constantly bubbling. 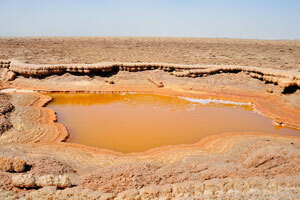 Sulphuric lake is one of the destinations in the Danakil Depression, don't miss it. 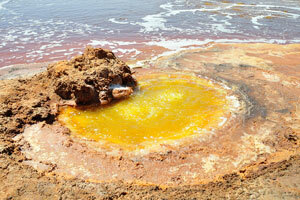 Lake was nicknamed “Yellow lake” because of its striking colour. 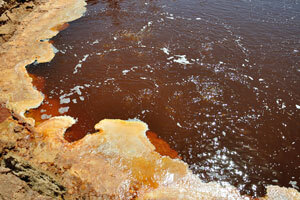 Phenomenon of this lake is caused by high sulphur in the volcanically active region. 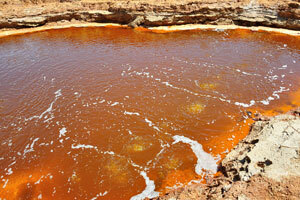 This tiny acidic lake is located adjacent to Yellow lake. Bubbles created the foam on the lake surface. 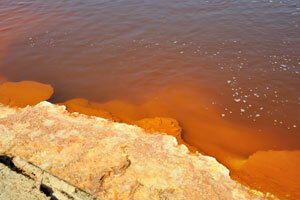 This lake with highly turbid orange water is also located adjacent to Yellow lake. 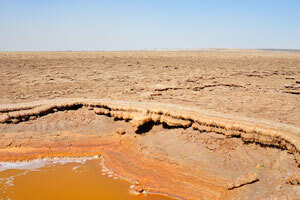 View of the Salt canyon from Yellow lake in the Danakil Depression. 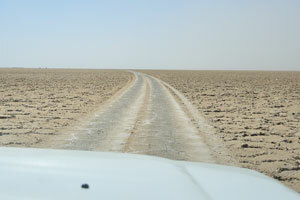 We are on the road from Yellow lake to the Salt mine.